The fencing erected across street entrances and open spaces along the 850 metre bull running route and the 450 metre long route from the main bull enclosure to the pen at Santo Domingo, comprises 13,000 parts, including nuts and bolts, wall brackets, washers, wooden wedges, and, of course, 900 vertical posts and 2,700 horizontal planks. Each plank and post is marked with a letter and number to ensure that it is mounted in exactly the same place every year. 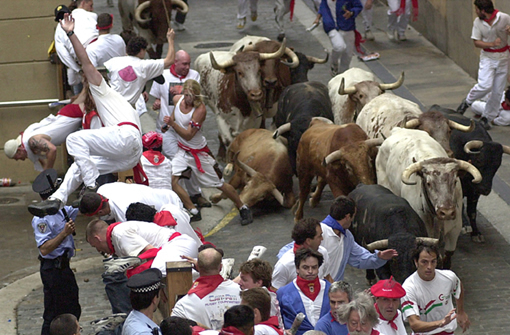 Most of the sections of the fencing are erected at the end of June and are not taken down until the end of the San Fermin fiestas, whilst other sections are put up each day for the bull running and then taken down by a team of 40 carpenters, to ensure that the traffic is not obstructed. Most of the fence is made of pinewood from the Roncal and Huesca regions whilst other planks are made of elm wood and are more than 100 years old. All the horizontal planks and vertical posts, which are anchored to the ground in 40 cm deep holes, are reinforced with metal plates to withstand the possible impact of a 600 kg bull running at full speed. There are also 12 gateways along the route, which are closed one after the other, once all the bulls have passed through a particular section, in order to prevent the bulls from running back to the start of the route. In the Middle Ages and part of the Modern Age, the streets leading off from the bull run route were simply blocked off with blankets and carts until finally, in 1776, the City Council decided to erect wooden fencing to put an end to the frequent cases of bulls escaping through the streets. In 1941 the safety and sturdiness of the fencing was increased still further with the erection of a double fence with a two metre gap between the front and back fences. This decision was taken because the July 8, 1939, a bull of the herd Cobaleda Sanchez called "Liebrero" broke the only existing fence, took seriously a spectator to the closure and had to be shot dead by the civil guard at the bullring main entrance.